The Canned Fish Swimming Upstream project was originally started as an attempt to journalistically document what was actually happening in local churches that related to NCMI (New Covenant Ministries International) in the arena of worship. Word was sent out to the relating churches to submit songs that were working. The material for the album was not simply to be songs that were trendy, good or catchy, but songs that were actually being used successfully in the worship process at the various relating churches. 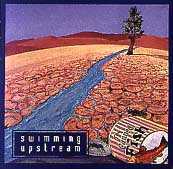 On the Swimming Upstream album, professional musicians who were Christians, and in relationship with one another were approached to be involved with the recording. Where possible, the goal was to let the songwriters sing their own songs (hence the variety of lead vocalists on the project). The project has evolved somewhat over the last year or so, and a band has begun to form consisting of musicians from basically two local NCMI churches in Johannesburg, South Africa. These musicians are prolific writers and another album was recorded in February 1997. The line-up has changed a bit, but the journalistic intent has remained. The focus of the group is to be available to be an expression of praise and worship in any and all situations. They are able to teach and run workshops as well as play as a band in the leading of worship. The style of their music (and especially the new, as yet, unrecorded material) is not anywhere near the usual Christian worship sound and tends to be somewhat rocky and declarative. They do not draw from any particular style at present but seem to be evolving one of their own. Lloyd Martin - Drums and vapours. Recorded and mixed at Joes Garage, Johannesburg. Marketed and produced by: Frontline Music, P O Box 67209, Bryanston 2021, South Africa.